I have a long relationship with the Junior League of Northern Virginia and as a previous member I believe in the work that these wonderful women do in support of kids, women, and families in our community. I am so proud to be a part of this event and having the opportunity to support a good cause with my book, Marco the Little Chef. Come out and see me at The Enchanted Forest and support your community while having a great family day full of great holiday memories. Stroll through the whimsical forest of theme-decorated holiday trees, have Cocoa and Sprinkles Cupcakes with the Ice Princesses or Breakfast and Brunch with Santa. 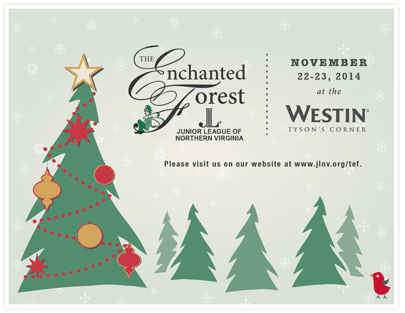 The weekend-long festivities, presented by the Junior League of Northern Virginia and featuring Kids in the Holiday Kitchen, include live entertainment from Mr. Knick-Knack, the Great Zucchini and more, model train display by the National Capital Trackers, science experiments by the Children’s Science Center, themed crafts for children, gifts and holiday decorations for purchase, a live and silent auction, and more. On Saturday join us for the Frosted Glitz Gala, an evening gala celebration with open bar, hors d’oeuvres, DJ, ShutterBooth photos, and Vegas-style gaming from Always Fun Casinos for the adults. The income generated supports our community programs, which include nutrition education programming, free school physicals, immunizations, backpacks for uninsured children, monthly arts, crafts and educational enrichment programs in area homeless shelters, and our partnerships with Girls on the Run, the Children’s Science Center and FitArlington. Your donation and support also provides necessary funding for our annual grant program; this past year’s recipients included Arcadia Farm Camp, Child and Family Network Centers, Cornerstones, Healthworks, and Northern Virginia Therapeutic Riding Program.